In September 2014, CPFF launched an awareness campaign that caused quite a stir and garnered a lot of attention. 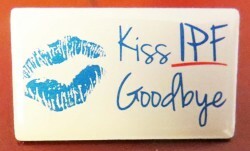 #KissIPFgoodbye is a campaign designed to educate and raise awareness about IPF, and rally public support through social media. We used an image of blue lips to grab attention of Canadians and it worked. 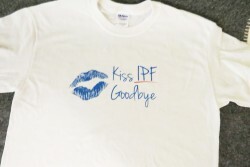 During the month of September 2014, with each Facebook share of IPF educational videos, $5 was generously donated by our Corporate Sponsors to the Foundation. We exceeded our target by $20,000 for a total of $30,000. But we kept sharing those videos because IPF Awareness not just in September! The blue lips will continue to be the symbol for the campaign as it continues to gain momentum and soon it will be going global. Why blue lips? 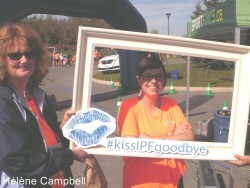 As IPF shares symptoms with other lung diseases, using blue lips provides a unique platform to grab the attention of Canadians and to be able to tell our story. Rose McGowan, actress, director and IPF advocate, helped us launch the campaign with much enthusiasm. As a famous American actress known for her role in “Charmed” a popular television series, Rose shared her personal experience about being a caregiver to her father who was diagnosed with IPF. Rose was a hit with the media and Canadians. 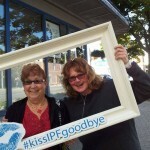 In one day, September 18th, she appeared on Canada AM, The Social, Global Morning National, Breakfast Television and the Roz & Mocha show, spreading awareness about IPF. Click on the section below to view media clips of Rose. She also appeared in print and online with an article in The Toronto Star, Metro News. There was also coverage online for the community event held in Smith Falls spearheaded by IPF Patient Advocate Jacqui Bowick — Week-long fundraiser shows power of a smile (Inside Ottawa Valley – Sep. 22, 2014). How did we know we were raising awareness – because the numbers don’t lie. How far did we reach? The marketing statistics can be found below. 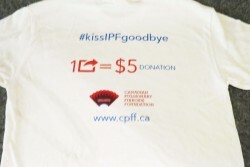 If you’re interested in purchasing a Kiss IPF Goodbye Shirt or Pin, email robert@cpff.ca. The total number of times the potential audience (including duplications) was exposed to a message within a specific period. The number of audience members who potentially receive a message. Most reach measures use circulation/audience share figures. A measurement of the nature and extent of audience engagement through two-way conversations, the sharing of information, and other interactions such as subscribership. Included in this measurement are such considerations as reach and tone delivered by blog posts and comments, linkbacks, tweets, and retweets. Our mission is to raise funds to finance research to better understand pulmonary fibrosis, develop treatments, provide support to patients and caregivers, and find a cure for this disease. Our ultimate vision is to make lung transplant the LAST resort, not the ONLY resort.